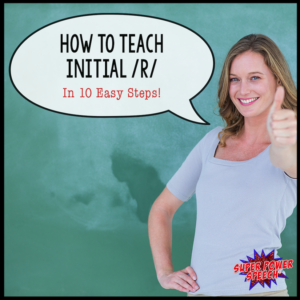 Do you ever work on initial /r/ with your students? Yep! Me too! Almost every. single. day. And you know what? Most of my kids master initial /r/ in ten sessions or less! How? 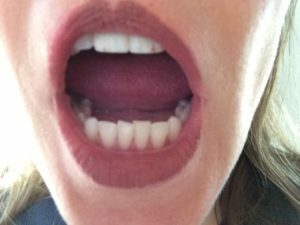 I read an article eons ago about how to stretch out your tongue to teach the /r/ sound. And I’ve been doing it ever since! 1. Learn techniques for creating a puffy wide tongue. The tongue may look like a bowl (see my daughter’s tongue below) or a wide marshmallow (see my tongue below). 2. Hold the puffy tongue and add a short /a/ sound. The sound along with the puffy tongue helps develop motor memory as well as getting the child used to vocalizations near the back of the mouth. 3. Slide from initial short /a/ (puffy tongue) into long vowel sounds. This technique reinforces motor memory as well as aids in the transition to words. It is important that students understand that they cannot close their lips when adding another sound! They must keep their lips open the entire time. Note: I have had much greater success using “oo” instead of “you”. 4. Slide from initial short /a/ (puffy tongue) into short vowel sounds. 6. Shift the /a/ (puffy tongue) into an /r/ sound. Shift the /a/ sounds into an actual /r/ sound. Add long vowels + consonant sounds. Remind students not to close their lips at all in these words. 7. Say one syllable /r/ words. Using the new /r/ sound, practice a variety of one syllable initial /r/ words. These R+VC words should not contain any bilabial sounds. Remind students not to close their lips at all in these words. 8. Say multi-syllabic /r/ words. Using the new /r/ sound, practice a variety of multi-syllabic initial /r/ words. These R+VC words shouldn’t contain bilabial sounds or more than one /r/ sound. Remind students not to close their lips at all in these words. 9. Say one syllable /r/ words with bilabials. Using the new /r/ sound, say one syllable words with bilabial endings. Remind students to be very careful and only use their lips on these final sounds. Use a mirror or video recording to help students watch their lips. 10. Say multi-syllabic /r/ words with bilabials. Use a mirror or video recording to help students remember to keep their lips apart and their tongues puffy for the initial /r/sound! My son has been trying to master the r sound for almost a year. I’d like to try these steps with him. How many steps do I do each day? Do I review for a few days before moving on? I have a R Sound Shout Out game I made specifically to help him practice, but until now I didn’t know how to coach/teach him. Thank you. Hi Melanie, it sounds like you need to be consulting with a speech pathologist. These steps are intended to help SLPs with their clients. If they want to use this approach, then they will determine the rate of steps. Great tips! I will definitely try it out with my next /r/ case! Do you think this trick will work with retroflex tongue position? I’m really not sure. I’ve never had any luck with retroflex. I love these tips..thank you! Thanks for the Tips!! I can use all the help I can get! I am a recently certified SLP and teaching the production of /r/ is so challenging! I really appreciate the tips! Thanks for sharing! Printing this and taking it with me to my speedy speech guys!